ostalgia is a powerful thing. How many of us have fallen into the trap of picking up a “classic” from our youth only to find out it’s not half the game, or movie, we thought it was. So have Lizard Cube manage to rest on nostalgia, or have they applied some love and attention to this classic. 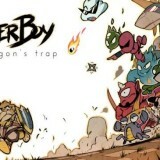 Wonder Boy: The Dragon’s Trap was originally released back in 1989 as Wonder Boy 3. You’d be forgiven for questioning the gameplay on a title that is almost 30 years old. Yet Dragon’s Trap sports gameplay that will be more than familiar to those who’ve played earlier Castevania or Metroid titles bringing an element of RPG and exploration to the more simplistic platformers that Wonder Boy was better known as. 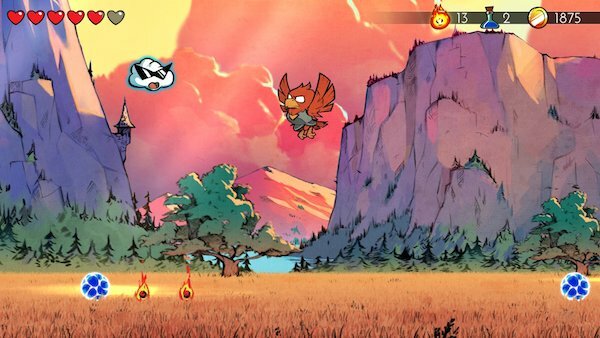 Playing as the titular Wonder Boy (or Wonder Girl… this is the 2010s you know!) you make your way around lavishly recreated levels all with a distinctively different look and feel. Here you must battle enemies and traverse platforms to unlock doors and chest to eventually unlock that locations dragon. Once the dragon has been defeated it unlocks a new outfit. Once collected these outfits are equipped and can then lend themselves to new abilities. For instance one will spit fireballs, another will stick to surfaces allowing better level traversal and reaching higher places. Another will let you tackle water areas more easily. The game has a surprising depth for such an early title. 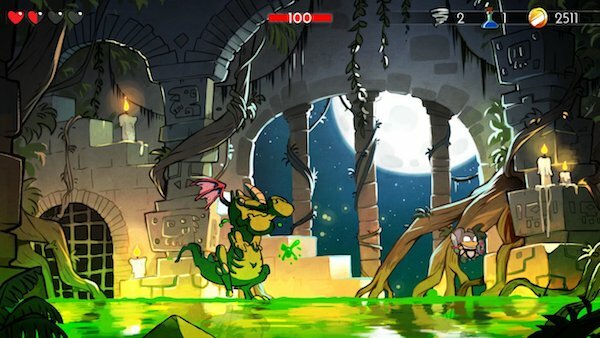 Visually Lizard Cube have done an incredible job of reworking the original levels. What was just generic background fodder (Forest, Desert etc) now has a beautiful hand drawn look. The artwork looks fantastic and has animation to match. Being able to swap back and forth from the old graphic to the new is a nice touch and activated on the fly and highlights just how far these titles have progressed. Similarly you can swap back and forth between the new soundtrack and the older chiptune counterpart. These are toggle independently so you can listen to the new soundtrack with the old visuals and vice-versa. It’s a small thing but a nice touch. What might first look like a simple platform game offers something more akin to a light RPG or a Dark Souls game… slowly picking your way through areas, judging which persona fits the best in each, timing attacks just right and exploring all from a hub world. The game lives and dies by it’s 80s game mechanics. Some are frustrations from the older mechanics (repetition for one) and others are likely technical issues from trying to maintain two graphical versions at the same time (for example the hit boxes are a little off at times adding to frustration). The game also suffers from an incredible shift in difficulty part way through – it always has. 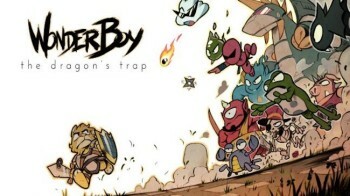 Lizard Cube have done an incredible remaster for Wonder Boy: The Dragon’s Trap. It’s faithful, to a fault, and absolutely beautiful to listen to and watch. They’re not just trading on the nostalgic feelings of gamers they’re showing some real love and attention to the subject and that shines through with every aspect. If you’ve never played the original and enjoy your exploration platformers then I can certain recommend this. 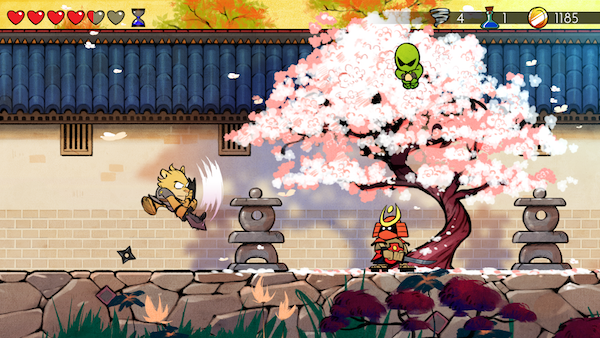 The couple of niggles that hold it back are mainly due to the nature of the older game design. If you can look past those then you’ll get 9+ hours of great looking platform action.